Is anyone interested in a reference handbook? I think I will self-host a MediaWiki. If you are going to self host a wiki I submit pmWiki for consideration. It requires significantly less resources than MediaWiki unless you specifically need something mediawiki does or are running a really large scale site. If you figure out some way to automatically import and parse the plugin.json files for each plugin, then use that information to update the affected module’s wiki page automatically as details change, your project would already be halfway finished. I feel like this doesn’t really result in a good reference handbook. What I would expect (as is how my own unfinished handbook is written) is more of what the module does, what the knobs and CVs do, why I care that it does this, and so on. Unless I’m mistaken the plugin manifests just list what Rack section they go in and what plugin they belong to, they don’t tell me what the weird color changing buttons do on Mutable’s Resonance plugin. You could probably use the manifests as part of a set of canary scripts that go mark pages for review, maybe. 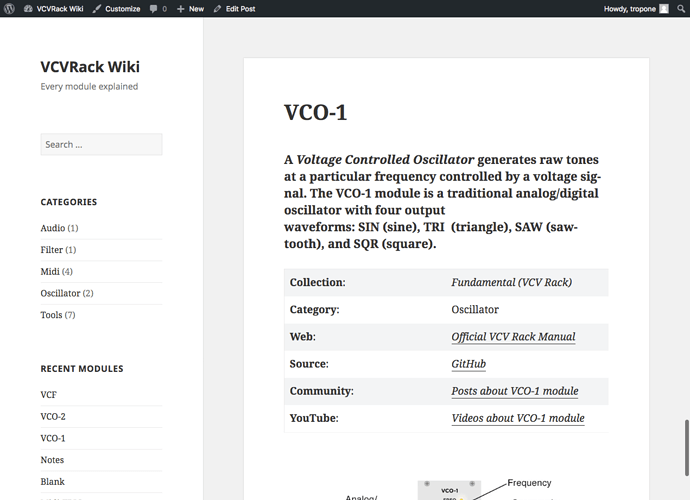 If you are interested, all the content (text and images) of the Vult site (https://modlfo.github.io/VultModules/) is available in markdown format. I use that content to generate the web page. Whilst I agree that a central database driven resource much like the Modular Grid one is a worthy and necessary resource for an open source system which already offers more than 1k modules; I don’t believe that it should necessarily negate guides being written with a specific point of view. VCV will only grow in popularity and developers will come and go as the barriers to entry are less than those in the hardware modular world. And the things one can do with a modular system have almost as many use case scenarios as the number of modules. I’ve always believed that there is no such thing as a definitive modular concept or use case scenario. And with that in mind, there’s room for independent voices that appeal to vertical segments within the wider VCV community to share knowledge based on their particular use cases. I also believe that this subjective ‘editorial’ content can exist side by side with unopinionated technical documentation. As part of another business, I’m deeply involved in the field of digital content creation (DCC’s). I work with Foundry, developers of Nuke & Modo amongst many other DCC technologies and also with SideFX producers of Houdini. Nuke and Houdini are very much akin to woking with a software modular system. They’re equally inspired by a UNIX like approach of many discrete units being more sustainable and powerful than monolithic solutions. In the past, great efforts were focused on technical documentation (and that still continues today) but what we found was that technical documentation only works well for those that already know their way around the various ‘operators’ (the DCC equivalent of modules). It was only by ‘editorializing’ certain aspects of the content within the technical documentation systems that it became more accessible to all, and more specifically, more useful to various vertical user groups (VFX, motion design, medical visualisation, design visualisation etc). I believe something similar to also be important in the world of VCV and the wider world of virtual modular. At the moment Softube Modular, Cherry Voltage Modular, VCV (plus the wider worlds of Max and Reaktor) attract delineated camps of developers. But’s it’s my belief that over time module developers will come to view each of these platforms as different ecosystems for their creations and this less partisan approach to virtual modular platforms will in part be of a self-preservation strategy (moving from hobbyist to independent business will necessitate the widest possible universe of potential customers). In summary, I believe that a technical documentation platform for VCV and it’s growing library of third-party modules should take some of these wider considerations on board. It’s yet to be seen whether virtual modular will like it’s hardware cousin settle on a single platform. It’s also yet to be seen whether the impact of changes to plugin architectures and the Midi platform itself will be the thing that enables’s the wider world of DAW technologies to be more in sync with virtual modular approaches. Most of all I think it’s important that didacticism should be avoided, there is no ‘one’ modular way to the world. You can ask me specifics about IP and licensing at contact@vcvrack.com. On the left side will be a Navigation by category and everything will be searchable. Where can I access this wiki? Am I missing the link somewhere? It was put on hold.